The Omega 3 Fish Oil w/Triple Strength EPA & DHA 2400mg are a perfect source of essential fatty acids for our dog's diet and one of the key ingredients in Dr. Dresslers Dog Cancer Diet. According to the Dog Cancer Survival Guide, Omega-3 fatty acids can help protect the body against cancer weight loss, it has been shown to help with depressions and shrink tumors within humans. Omega 3 fatty acids are called essential fatty acids because the body cannot produce them - they must be obtained from food sources or through supplementation. The two main long chain highly unsaturated fatty acids (HUFAs) are EPA and DHA, and are primarily marine-derived (found mainly in fish oil and fishmeal). 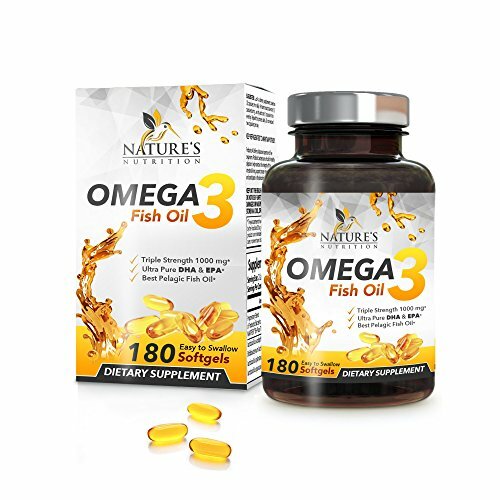 Nature's Nutrition Omega 3 Fish Oil supplement uses 100% Pure Sea-Harvested Pelagic Fish Oil, containing 1,440mg of Omega 3 fatty acids (864mg EPA; 576mg DHA) per serving. The World Health Organization recommends a daily intake of 300-500mg of EPA/DHA for adults, and the Western diet has an imbalance of omega 3 6 9 ratios so supplementing with fish oil has been shown to be beneficial. Nature's Nutrition Omega 3 Fish Oil capsules will help ensure you meet the recommended daily intake. Each serving (2 softgels) of omega 3 supplements contains 864mg of EPA, and 576mg of DHA, along with other essential Omega 3 fatty acids (DPA, SDA, ETA, HPA, EPA, DHA). Our omega 3 supplement for men is made in the USA in a strict, quality controlled environment and is free of all harmful contaminants. Nature's Nutrition Omega 3 Fish Oil capsules are an excellent choice as a daily omega 3 supplement for women and men alike. ?? 100% MONEY BACK GUARANTEE - We remove all risk. You have no need to worry about not loving your purchase as we promise to return 100% of your money if you are not completely satisfied with your purchase. ?? TRIPLE STRENGTH OMEGA 3 - Each 2,400mg serving of Nature's Nutrition Omega 3 Fish Oil supplements contains 864mg of EPA and 576mg of DHA - enough to reach the daily EPA/DHA recommendation for adults from the World Health Organization. ?? HEART, BRAIN & JOINT HEALTH FORMULA - Omega 3 fatty acids are essential fatty acids and must be obtained from food or supplements. The omega 3 fish oil dosage provided by each serving has been shown to support heart health, brain health, joint health, eye health, mood and skin health. ?? TESTED FOR SAFETY, POTENCY AND PURITY - Our Omega 3 Fish Oil capsules are independently tested by a 3rd Party Laboratory for safety, quality, potency, and purity. Additionally, the product is manufactured in a strict, quality controlled environment and is free of all harmful contaminants. ?? RELATED: omega 3 fish oil triple strength 1000mg 1000 1200 3s 6 9 acids benefit benefits best bioscience bodybuilding brain burpless caps capsules carlson cod dha dogs dosage effects epa fatty foods garden good hair health healthy kids krill life liquid liver mega men mg much naturals natures nutrition nordic oils omega-3 organic pills power salmon shoppe side small source sources supplement supplements tablets take taking three uses vegan vitamin vitamins with women.